This is a superb Hand Signed Black and White 5.5" x 3.5" publicity photo by the popular Scottish actress. Annette Crosbie OBE (born 12 February 1934) is a Scottish character actress. 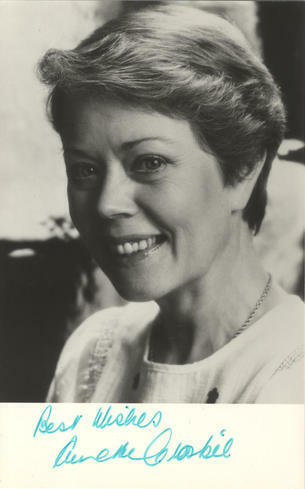 Crosbie was born in Gorebridge, Midlothian, Scotland, to Presbyterian parents who disapproved of her becoming an actor. Nevertheless, she joined the Bristol Old Vic Theatre School while still in her teens. Her big break did not come until 1970 when she was cast as Catherine of Aragon in the BBC television series, The Six Wives of Henry VIII. A few years later, Crosbie made a similar impact as another Queen, Victoria, in the ITV period drama, Edward the Seventh (1975). She played Cinderella's fairy godmother in The Slipper and the Rose, which was chosen as the Royal Film Première for 1976. In that film, Crosbie sang the Sherman Brothers' song, "Suddenly It Happens". In Ralph Bakshi's animated movie The Lord of the Rings, filmed in 1978, Crosbie voiced the character of Galadriel, Lady of the Elves, and in 1980 she played the abbess in Hawk the Slayer. In 1986, she appeared as the vicar's wife in Paradise Postponed, and Julia Wilson in Farrington (1987). Crosbie's next major role was as Margaret Meldrew, the long-suffering wife of Victor Meldrew (played by Richard Wilson), in the British sitcom, One Foot in the Grave (1990-2000), for which she is best known. She also played Janet, the housekeeper to Dr. Finlay, in the 1993 revival of A. J. Cronin's popular stories. She also had a poignant role in the 1999 thriller The Debt Collector. Crosbie's other roles include playing the monkey-lover Ingrid Strange in an episode of Jonathan Creek, the character of Edith Sparshott in An Unsuitable Job for a Woman, and as Jessie in the film Calendar Girls (2003). In 2004, Crosbie made a cameo appearance alongside Sam Kelly in an episode of the third series of Black Books, starring as the mother of the character Manny Bianco. Crosbie has also appeared in A Touch of Frost. She also appeared in the sixth and seventh series of the BBC Radio 4 comedy series Old Harry's Game, in which she played a recently deceased historian called Edith. In 2008 she appeared in the BBC adaptation of Charles Dickens' Little Dorrit and also appeared in an AXA Sun Life television advertisement for the over-50s. As of 2009, she can been seen as Sadie Cairncross in the BBC television series Hope Springs. in 2010, Crosbie appeared in the Doctor Who episode entitled "The Eleventh Hour".